Home Articles 2013 Will Ethics Revive (Exhume?) the Drug Industry’s Reputation? 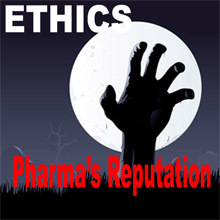 Will Ethics Revive (Exhume?) the Drug Industry’s Reputation? We all know why the drug industry has a bad reputation. For one thing, it has been found guilty of unethical and even unlawful practices that include hiding clinical trial data and illegally marketing drugs. How to improve the industry’s reputation is a perrenial question. So it was with great interest that I read about a new effort to improve the drug industry’s reputation: the establishment by a bioethicist of an accreditation rating system. Jennifer Miller, a fellow at the Edmund J Safra Center for Ethics at Harvard University and president of Bioethics International, a non-profit that advises educational programs on ethical issues on medicine and healthcare, is trying to develop the industry equivalent of a “Good Housekeeping Seal of Approval.” This article summarizes her ideas and presents opinions of several naysayers.